The Pinhook has a new list of specialty drinks out, which means it was time to head out for a show! Not only did Aye Nako! and Dangerous Ponies give great shows—with impressively sparkly outfits to match—but the Point Break cocktail provided a smooth drink to relax my way into dancing. It’s made with Absolut Citron, Campari, orange juice, and club soda, and “balanced, extremely mellow, Keanu-free” were the tasting notes that sold me. I was surprised at how strongly it tasted of grapefruit on first sip, likely because the Campari was huddled at the bottom of the drink. 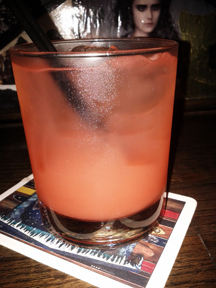 After I mixed it up some, though, the Campari melded much better with the orange juice. Bitterness shifted into tartness with enough club soda to cut through it so it wasn’t overwhelming, just enjoyable. I found the Point Break quite refreshing and balanced, though make sure you give it a stir before drinking.